The Twilio IPO just sent a wave of optimism throughout the tech IPO sector. Yesterday evening (Wednesday, June 22), Twilio Inc. (NYSE: TWLO) priced its initial public offering at $15 a share and raised $150 million. The Twilio stock price immediately opened at $23.99 this morning. That means any investors who bought shares yesterday at the $15 Twilio IPO price saw an instant return of 59.9% when the stock hit the market. Today, we're going to show you a safe investing guide for investing in stocks like Twilio. Twilio lets developers build messaging and video functions into their smartphone applications. And it is the first tech "unicorn" to go public in 2016. A "unicorn" is Silicon Valley's term for private tech firms with valuations exceeding $1 billion. 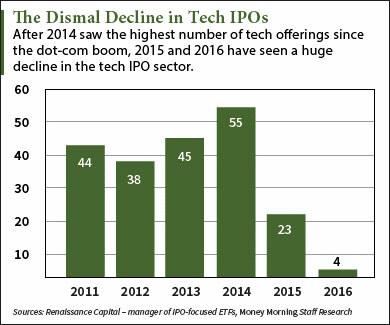 Many of these firms are avoiding IPOs due to declining funding rounds and the Nasdaq's 2.3% drop this year. Many of these firms are having trouble getting additional funding because of their already massive valuations. And many don't have the revenue or profits to support such high values. Uber – one of Twilio's biggest customers and also the world's highest-valued startup at $68 billion – earned a profit of $0.19 per ride in the United States last February. But the company is hemorrhaging money everywhere else in the world, including China, where it's losing more than $1 billion a year, according to CEO Travis Kalanick. But these unprofitable tech firms still attract huge investor interest. Just look at the Twilio IPO. Twilio lost $35.5 million in 2015 and still had a private valuation of $1.2 billion. And shares of TWLO stock have continued to climb throughout the day. As of 1 p.m., the TWLO stock price is up 70.7% from its IPO price and trading at $25.61. Although this huge return is tempting, the IPO market can be risky for retail investors like you and me. Anyone who isn't a big-shot banker on Wall Street or hedge fund manager can see big losses if they don't follow a disciplined investing strategy. "IPOs are nothing but a get-rich-quick con game in which the odds of seeing an immediate profit are heavily stacked against you," Money Morning Chief Investment Strategist Keith Fitz-Gerald said. "That's because retail investors are the last in a long line of investors and traders trying to make money from an initial public offering." If you don't have a specific strategy for investing in the Twilio IPO, investors could rack up losses. The first thing you need when investing in TWLO stock is patience. In fact, you'll need to wait until the Twilio IPO lock-up period has expired. After a new stock starts trading, institutional investors – like those Wall Street bankers and hedge fund managers – are restricted by an IPO lock-up. This is the stretch of time after a company goes public in which they aren't allowed to sell back their shares. Twilio has a 180-day lock-up that started on the date of the IPO filing. That means early Twilio investors will be able to sell their shares the week of Nov. 21, 2016. This gives investors like you and me plenty of time to assess the firm's growth and avoid the early volatility typical of new stocks. The second step to investing in TWLO stock is judging the company's financial growth. The only way to do that is to wait for the company to release at least three earnings reports. One bad quarterly report can send a newly issued stock crashing. For example, online marketplace Etsy Inc. (Nasdaq: ETSY) hit the market in April 2015 and shot up 88% on the first day. But the firm posted a $36.6 million loss in its first report as a public company, which sent ETSY stock down nearly 20%. With surging losses, Twilio could head down the same path as Etsy. The only way to determine if it will dig itself out of its hole is to wait for at least three earnings reports to come out. And the third and final step is to use a lowball order. A lowball is an offer to buy shares of a stock at a significant discount to its market value. Placing these orders means you're purposefully offering a low price to attract sellers desperate to quickly get rid of their shares. Lowballs are perfect for newly issued stocks because they put the power in your hands. Since you determine the price, you're protecting your money by letting the market come to you. The Bottom Line: The success of the Twilio IPO speaks volumes about the state of the tech sector. Although highly valued tech firms have been derided lately, Twilio stock's 60% surge today shows that investors are interested in tech IPOs again. But new stocks almost always surge when they first hit the market, which can tempt retail investors into buying shares right away. The smartest way to make money from TWLO stock requires patience. We recommend waiting until the lock-up period expires, assessing Twilio's financials over the next three quarters, and using lowballs to set your own prices. Alex McGuire is an associate editor for Money Morning who writes about upcoming IPOs. Follow him on Twitter for the biggest news on the Twilio IPO.